Lilly's Life: What does a Rhino have in common with me? What does a Rhino have in common with me? And if you guessed we can both be cows.......I don't really care if you have a good point or not, turn around and keep walking. My niece recently went on a school trip to South Africa and she made some very cute videos of the local wildlife. Here is one of her videos of a Rhino cow and a calf. Rhinos are not only cute and have thick hides, but they also have bad hair, poor eye sight, a great sense of smell and excellent hearing. And they also eat for a large part of the day. I read that and watched the video, and it all seemed a little bit too familiar for my own liking. Particularly right now, after my own recent excursion into the wilds of South Yarra (Melbourne). I blame my daughter entirely. Oh yes siree. She told me she had ordered six 'special' Christmas decorations from a certain design store which she had to pick up on Christmas Eve. I couldn't work out why she had to wait to pick them up, so I thought I would check out the store myself given I was in the neighbourhood. Talk about a jungle. I had to fight my way to get out of there. I finally managed to walk out with a waddle that any self respecting Rhino would be extremely proud of. 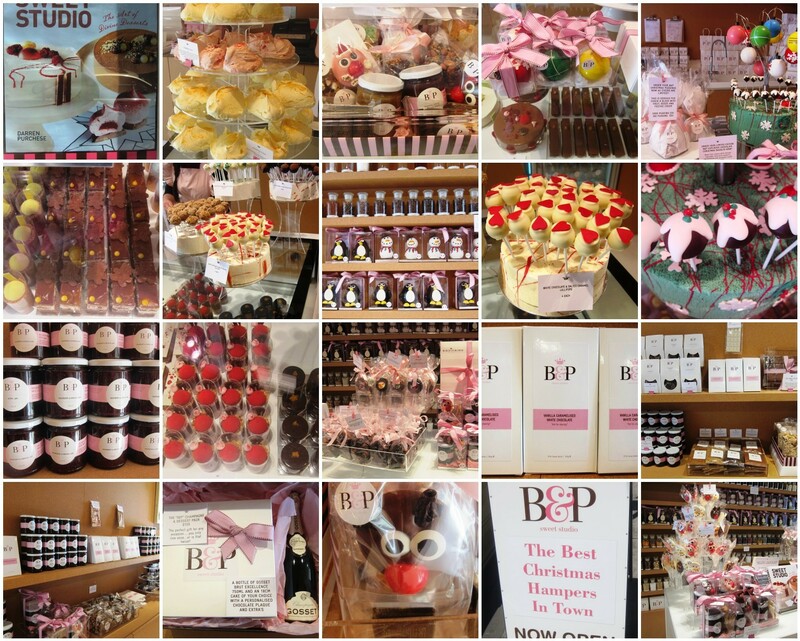 The store is Burch & Purchese Sweet Studio. My kind of grazing land. I finally found the decorations she ordered. 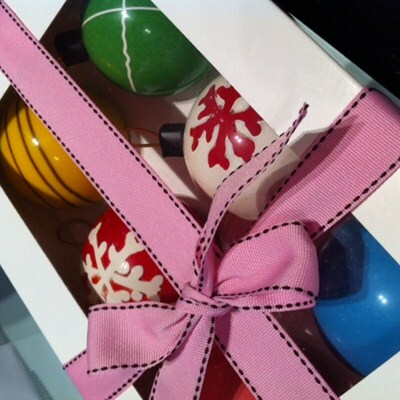 Highly coloured baubles. Highly coloured EDIBLE Christmas baubles to be exact. They are made from white Belgian chocolate filled with chocolate coated pop rocks (??) and raspberry marshmallows. This store is like a modern day Willy Wonka Factory. The open Kitchen looks like part Science Labatory. Amazing works of sweet art (click on picture to enlarge it if you dare)..
You might be surprised to know that I took a risk and tasted quite a few different products. I really had no choice. It would have been incredibly rude to decline the offers of samples would it not? Now, the only discouraging part about my trip to Sweet Studio is that I now want to totally change my Christmas menu plans. At this stage, I am thinking of making it much simpler and having - Chocolate, Chocolate and more Chocolate. I mean, you can't really go wrong, can you? And that leaves me with another dilemma - my holiday wardrobe. I have had to entirely rethink that as well. At this stage, I'm thinking Kaftans, Kaftans and more Kaftans. Colourful ones, naturally. So what is your favourite food over the holidays? Family favourite? Something new? And no, the store's clever owners are not paying me in money or chocolate to talk about them. Their amazing works of art speak for themselves. They also have an online store so that you can make a total rhino of yourself in private. The 12 Days of Giveaway ends at Midnight tomorrow night, Australian Eastern Standard time. Please enter if you haven't already. It's not like I'm going to make the winners read all my blog posts for the next five years or anything.... Good Luck everyone. Winners announced late on 1 December 2012. I will knock at your door with the good news (settle down, I mean via email - you don't need to tidy up the house on my account). Any place that gives out chocolate samples is good by me. I don't know if I have a favorite holiday food. Mulled wine, maybe. Chocolate is a food group on its own I think. If you were closer I would invite you over for samples. Mulled wine? Yum! I guessed a cow without a second think, but I am always spot on you know that. That chocolate looks divine. I am so glad these holidays only happen once a year. My favourite is definitely Pavlova. Not very traditional here but a dish I stole from my Aussie friends. If you go into a sugar coma after that lot it would be so worth it. Looks yummy. Yes you would have done, lol. Pavlova really? Maybe chocolate pavlova may be an idea. Nothing like a pavlova.. I too may be a Rhino! Love the chocolate Christmas decorations....anything chocolate has my attention. Have a wonderful day! Something we have in common, the world over. But that chocolate - sinful!! *sigh* I have to take a Glucose 1 hour test mid-December, so I'm trying my hardest to stay away from sweets... worst timing in the world, I say! What a question, my dear Lilly...Why chOCOLATE, of course!! LOL!! That store looks irrestible! As In: YUUUUUUMMMMMMMMMMMYYYYYYYY!!! I must say that Rhino Video is really cute! And very familiar looking, too. Naomi, you and I could do some damage in this store together. It is totally yum and you would love the sheer art of it all. It is very cleverly done. The rhinos are cute. Did you see the penguin one? Funny comparisons. You have the wardrobe problem wrong. It's your January wardrobe that will become a problem just in time for the annual workout sign-up ads. A little translation help (I know damn Americans) - what's a Christmas Hamper? No i am sure the kaftans will just vlow into January too....It is true as soon as Christmas and NY are over it is gym sign up time here too. I aim to be good as I am going on a cruise on December 30th as well. I do not want to sink the ship. Baileys Irish Cream oh yes and I like it on ice cream too....oh I have lots of fond memories of that and lived to tell the tale. No, I never say damn Americans at all. A Christmas Hamper is just a basket of goodies. This store like every other one does a basket up with a slection of its products and you can buy that as a gift for someone. A hamper from this store would seriously kill you. What do you call them there? Seriously? A school trip from Australia to S. Africa? I thought Illinois to Washington D.C. was far! My glucose level rose just from reading this fun post. Yes it was a school trip. What a wonderful experience. She took some amazing photos and little videos. She and her father let me post them here. So cute. I posted the penguin one before too. Yes Kay I should have put a warning sign up. Looking at that chocolate is enough to to raise your glucose levels. Fortunately, this chocolate looks so good you don't want to eat it but look at it, frame it, take photos of it as if it was great artworks. OK, that could be a lie, you want to eat it too, eventually when you are done looking, lol. I enjoyed that video, thanks! And that is some sweet store, fantastic! Thanks Christine. you would need to work out at the gym triple time if you went in that store too often. I am with Sarah on this. I watched the video first and thought the similarities were amazing. And I think you have a tougher hide than a rhino for even posting this he he. Very cute video. Of course you would be, lol. what else would I expect from the pair of you! I have a tough exterior and am a melting mess in the middle. Just the way I like my chocolate come to think of it. We hang those rock candy canes, maybe sometimes small Toblerone bars but Belgian Choc baubles, that's pretty impressive! These field trips are getting more and more exotic and no doubt put a big dent in the wallet..
Toblerone, my favourite. We will see, sometimes expensive chocolate is not as nice as Cadburys - there I said it, lol. How did you walk out of there just tasting samples? Yummy. Oh my , oh my oh my, edible Christmas decorations - that seriously rocks! Same to you Mary and thanks for visiting. Coconut ice, my favorite but I only like it the way my Mother makes it. great sense of smell check! OMG I'm a rhino ARRGGHH ! mmmmmmmm.... CHOCOLATE ..... I LURVE CHOCOLATE! He he Kate. I have never met anyone who doesn't love chocolate. I will qualify that though, I have never met any women who don't like chocolate. Oh my goodness! THAT store looks AMAZING. I'm going to have to look it up - and then go there...and then eat everything. Now Deidre, when you do check it out please do not blame me that you spent a fortune on chocolate and put on 5 kilos. It will be wroth it though. It is just an experience window shopping if nothing else.